This is a great salad for barbecues, parties or tailgating. It's light and fresh and has lots of veggies. You can also change up the veggies and herbs to tailor it to the style of meal you are making. You could even add chorizo, salami or ham if you want to make it heartier. Put a pot of water over high heat while you put together the dressing for the salad. In a large bowl add the olive oil and salt & pepper. Zest your lemons with a Microplane (get one!) right into the bowl, then squeeze out the juice (watch out for seeds) and whisk it all together well. Chop the onions and slice the tomatoes, olives and artichokes and set aside. Once water is boiling, add 1 tsp of kosher salt, then the orzo. Boil for about 8 minutes then check for doneness (you want the pasta to be cooked through, but not mushy). Once it's done to your liking, drain in a colander and leave in the sink to cool. Put a small saute pan over low heat. Once pre-heated, add pine nuts and toast for about 5 minutes, until just a little browned. Shake pan often to get all sides on the heat. Remove and set aside to cool. 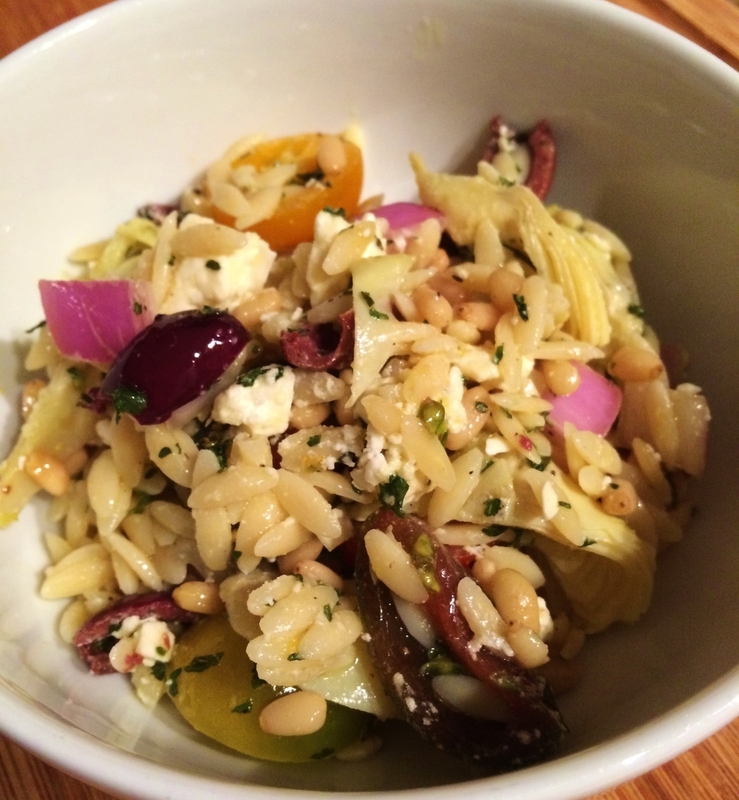 Once the orzo is cool, add to the dressing and mix well to coat. Then add the veggies and fold everything together. If you are serving right away, add the feta and pine nuts and stir gently (if you aren't serving right away save the cheese and nuts to add later so they don't get soggy in the salad). That's it! This is supposed to serve about 8, but it also keeps very well if you want to keep it in the fridge for yourself and eat with several meals throughout the week.